I've always been a big fan of Aromatherapy. It started many years ago, when my children were babies and I went through one of the most stressful times in my life. That's a story for another day, but suffice it to say, I used Aromatherapy regularly as one of the things that got me through that terrible time. Candles, essential oils, linen mists, body sprays and lotions....you name it, if it was scented with essential oils, I used it. It's amazing how a particular scent can lift your mood or calm your mind. Oh, and then there was wine. That helped, too. Fast forward 25 years and I am still using Aromatherapy to help me through times of stress. What I deal with on a regular basis is nothing like the traumatic events I faced 25 years ago, thank God. But let's face it - we all have stress in our lives on some level, some more than others. There are bills to pay (yikes, all those bills!) and chores to be done (not enough hours in the day....I need a clone!) my own health scares as well as loved ones with health issues, family arguments and issues at work, and of course the occasional bear and those darned coyotes....the list goes on and on. I still enjoy a cocktail to ease my stress at the end of a long day, but these days I am also turning more and more to aromatherapy to help me get through life's daily struggles. In addition to the candles I routinely burn when I have an evening at home, I have now added diffusing essential oils to my evening wind-down. Essential oils are not new to me, like I said I started using them 25 years ago. I remember there was a little shop on Long Island, in the tiny town of Port Jefferson, that I used to love to frequent to stock up on my oils. The town itself was lovely, such a treat, not far from where I lived at the time, and I would bundle the girls into their car seats and head off for a nice day strolling around that sweet little waterfront village. I'd come home at the end of the day with a new oil or two to burn, and a good feeling after spending quality time with my girls in a village that we all loved. I don't live anywhere near Port Jeff any longer, but I have found a new amazing source for my essential oils, and I'm not gonna lie - I think I'm in love. Young Living Essential Oils - have you heard of them? 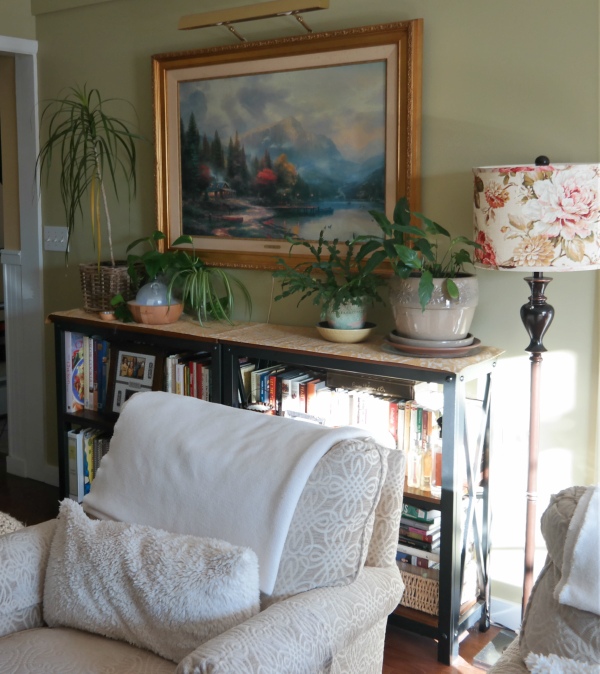 I first read about them on Melissa's blog, The Inspired Room, and I was intrigued. 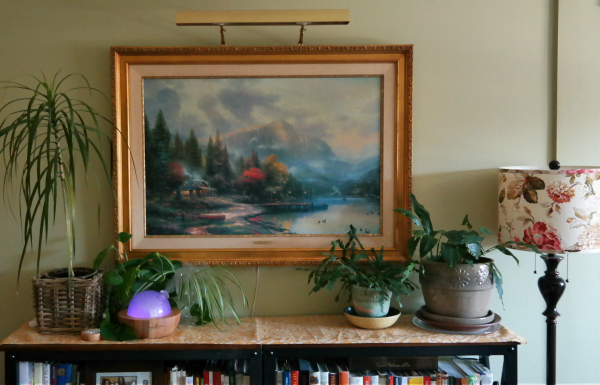 The idea of adding a diffuser to my home was most appealing, and I did a good bit of research all over the web about the many benefits of incorporating essential oils into one's life...on a side note, what on earth did we do before Google? But now, when I get home from work, one of the first things I do (after I take care of the puppies, of course!) is fill my diffuser, select my oil(s), add a few drops, and turn the diffuser on. I then go about my evening routine as usual...throw a log or two in the woodstove, start dinner, sort through the mail, unload the dishwasher, fold a load of laundry....all to the pleasant scent of the oil blend I have selected for the evening. Some evenings it may be a little Lavender mixed with Lemon and Peppermint....or Lavender and Pine....last night it was Lemongrass to help my sinus headache, this morning I used a little Orange oil to get my day off on a bright note. I also have a second diffuser for my bedroom, where I usually end my days with the aroma of Lavender and Cedarwood - a heavenly blend to help me drift off to sleep after a long, busy day. This whole menopause thing has most definitely affected my sleep, so anything I can do to get a better night's sleep is a huge bonus for me! I'm combining the diffuser with a blend of Lavender and Stress-Away that I roll on my chest, wrists, and the bottoms of my feet at bedtime. Aside from one or two random nights since I started this routine, on the whole I've been sleeping better than I have in a couple of years. There is most definitely something to be said for a good night's sleep! 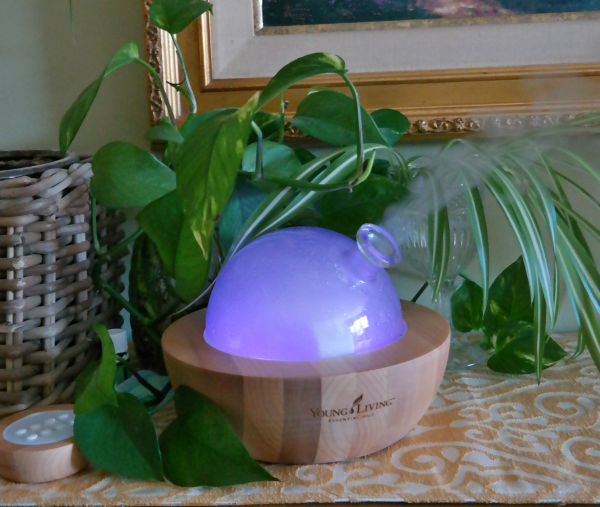 On my mornings off, I now start the diffuser right after I put on the water to boil for our morning coffee. I'll often choose a fresh, citrusy cent to start off my day on a sunshiny note. The scent fills my home, along with the aroma of freshly brewed coffee, and it's a fabulous way to start the day. If you haven't already started using Aromatherapy and essential oils to enhance your life, I strongly suggest you do! In addition to diffusing essential oils, I have added them to my wellness routine in the form of a few drops of Lemon or Orange Vitality in with my water - it most definitely has helped me increase my water intake, no doubt! I also drink two ounces of NinXia Red (also from Young Living) every afternoon around 1 pm, which has totally done away with the afternoon 'slump' I used to feel after lunch. It's absolutely delicious, and my energy levels have skyrocketed since I introduced NinXia Red into my daily diet! I feel as I did 10 or 20 years ago, when I had energy like there was no tomorrow! Oh how I missed that feeling! 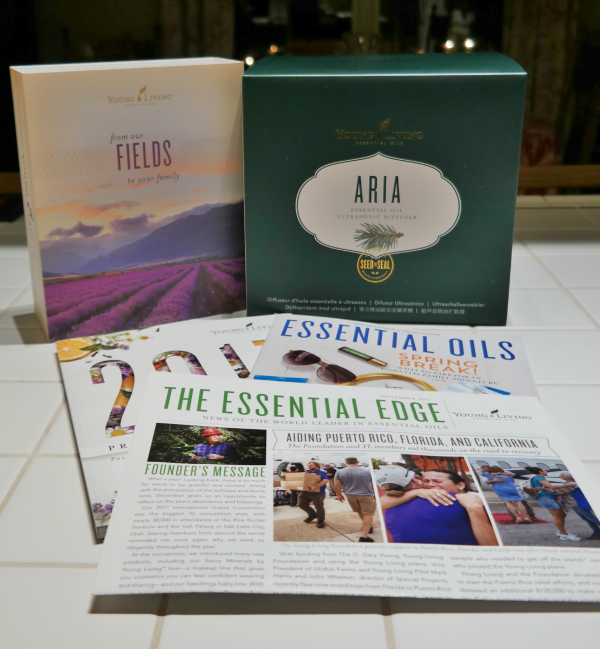 If you think Essential Oils might be for you, take a pop over to Young Living and check out the Premium Starter Kits - they are definitely the most 'bang for your buck' to get started on your journey. You will want to become a 'member' to purchase a kit - it doesn't cost you anything and you have no further obligation, but it does guarantee you get the wholesale pricing, which is far less expensive than retail pricing! When I reviewed the individual oils, diffusers, etc. it was going to add up to a LOT more than buy purchasing the kit, so I went with the kit, it just made sense. If you do place an order, please use my member number 13867635 in both the SPONSOR ID and ENROLLER fields so they know you are part of my essential oils family. If you have any questions about signing up, feel free to contact me directly using the contact me tab at the top of my page! I'm so excited for you to join me on the journey to learning more about the many benefits of essential oils in our lives! Stay tuned for more blog posts as I continue to explore the many ways essential oils help us on our path to a better, more balanced life! Meanwhile, I think this evening's blend will be Bergamot & Grapefruit - it is believed that Bergamot has a balancing effect on the nervous system and Grapefruit is uplifting and energizing. The perfect blend to diffuse before I head out for date night with my sweetie! I love my defuser. I’m enjoying Frankincense right now. I haven't tried my Frankincense yet - it's supposed to be wonderful for grounding you, perfect for times of meditation or yoga! I didn't know they made such pretty diffusers! Isn't it gorgeous, Ellen - I seriously love it!!!! It also plays music if you want it to, spa like....I put that on sometimes in the mornings while I'm running around doing chores before work - sets the tone for a great day! I love the looks of that diffuser! I bought a premium kit from them a few years ago. But the diffuser I bought was nowhere near that pretty. I sometimes run mine at night with lavender oil. Maybe I should try it in the daytime as well. There are so many oils to help lift your spirits and energize you during the day, Brenda - I think it would be very helpful especially in the winter when you are stuck indoors! You can also use oils to help you focus and boost creativity while you are blogging. And try combining Cedarwood with the Lavender at night - it's the perfect combo to help improve your sleep quality! It sounds as if you have a few lovely ways to ease the stress of the day. I need to find a few!! I think you have your walks on the beach to sooth your soul, Kim! Debbie, I love using the essential oils I've tried, but there are so many more. I haven't tried a diffuser, so I'm glad you gave us information about that. I am not a fan of scented candles because their artificial and chemical ingredients make me very ill, but essential oils are wonderful. I'm fortunate that I don't have a sensitivity to scents, but I am trying to limit my exposure to artificial scents and focus more on essential oils and holistic products. Maybe you should try making your own soy candles with essential oils? My daughter is a representative for Young Living but unfortunately I have to be really careful with certain "smells" because they trigger migraines. I know a few that I have to stay away from, but not all, so I have never indulged. I am so envious of those of you that can. Oh AnnMarie, that's such a shame, wow, I'd be in big trouble! Thankfully I don't have a sensitivity....at least not yet, but who knows in the past? Every year as I get older I seem to have more and more 'new' issues pop up!! I love using essential oils also! Lavender is one of my favorite scents. My sweet daughter in law is also a distributor, so I luckily get lots of oils from her as gifts or free samples. One thing I do not have is a mist diffuser, but mixing the oils in water and alcohol in a spray bottle will have to do for now. BTW - I like cedarwood and lavender when I am sitting by the woodstove reading a book in the winter. It just smells so cozy! Oh that sounds heavenly, Vickie! Do you keep water on top of your woodstove to add humidity to the air? I used to put oils in my water in my previous homes with those types of stoves. My stove now is a flush insert so it doesn't allow for that, otherwise I'd still be doing that! Haha - I used to do that...until I almost caught the place on fire! I had a little terracotta glazed bowl that I would put water and essential oil in, and it was perfect for the top of the woodstove. Until the day I forgot all about it. Holy cow, burning essential oil does NOT smell good and can actually catch fire when all the water has evaporated out! Boy did I learn my lesson. Now, I just spritz the chair I am sitting in, and if I am cuddled with a lap blanket, I will spritz that also. I used to use an old brass tiny tea kettle that I found in an antique shop in Ireland a million years ago - it was the perfect thing to keep on top of the woodstove!! Now it sits on top of my kitchen cabinets - oh well! I love essential oils and diffuse them often. 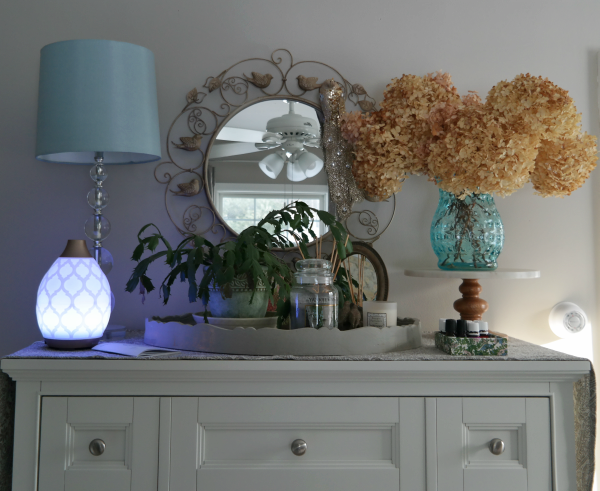 Though I have to say - your diffusers are much prettier than mine! I use the essential oils from NOW...they're very reasonably priced, plus I get a discount because my mom still works for NOW. ;-) I am so thankful for essential oils, as I don't burn candles in my house (I do have a couple of natural ones) or use any any plug-ins, etc because of the toxic chemicals in them. I'm curious, Melanie - what are your favorite blends? And do you have a blend for sleeping? Essential oils are the bees knees! Fragrance without the toxicity. There are a couple that the Urban Farmer puts in the diffuser in the bedroom that I don't care for as much as some of the other blends. Tea tree is supposed to be good on a lot of levels but I just don't like the scent. We mix it with vinegar to clean the chicken coop. Isn't that funny, Donna, I also hate the scent of Tea Tree Oil. I remember flying to Ireland one year and the flight made my whole face break out. The pharmacist recommended a facial cleaner with tea tree oil in it and every time I used it I gagged!! I eventually gave it to my daughter - she loved it! Oh well!! So yes, I will be staying away from Tea Tree Oil for sure! 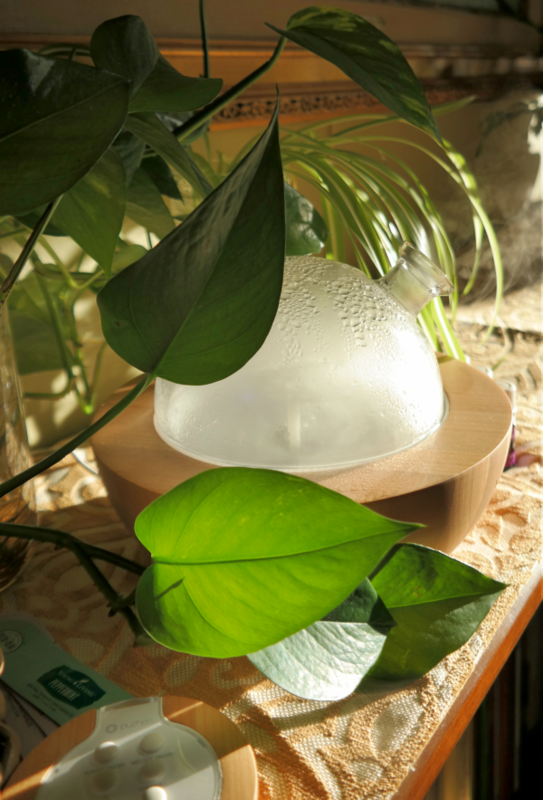 Your post has made me want to get out my own diffuser, while not as pretty as yours, it still does what it is supposed to, send out healing scents for body, mind and spirit. I have water and I have YL essential oils. I hope you did break out that diffuser, Lorraine - I am a firm believer that aromatherapy can help with stress, depression, energy, headaches, you name it! I have a diffuser and love it. I use it mostly at night in my bedroom. I love chamomile and lavender and sometimes a touch of vanilla. So relaxing and it keeps my sheets on my bed smelling like the lavender. Ooooh that sounds like a nice combo, Kris!! I'm using Cedarwood and Lavender at the moment, but I bet the addition of Chamomile and Vanilla would be just lovely! Believe me, I'm glad also, Nancy! For a while I was lucky if I got about 4 hours a night....it makes it tough to function! I had to look up what a Scentsy was, Debbie - ha ha I guess I'm clueless! I'm curious which warmer you have and what's your favorite scent? Also what does your cousin do with the boozy berries? Well my cousin eats those boozy berries straight up and they have become one of his favorite treats after a long hard day at work. ;) I have 2 warmers, one if a Christmas Countdown and the other is a brown one with a beautiful cross on it. I have so many favorite scents but tend to go towards ones that are not overly sweet or heavily perfumes. I like the cranberry, pear and cleaner scents for the most part. What a great gift, Pattie! Lavender and rosemary sounds great! I'm still diffusing lavender and cedarwood at night with some copiaba, which is supposed to increase the effectiveness of the other oils. I also mist my linens with lavender, and roll on two different oil blends! I'm sleeping better, no doubt, and functioning better in the daylight hours as a result! Oh my goodness, my daughter-in-law would be so proud of you! She is a proud Young Living believer too. She's going to Salt Lake City for the first time this summer. She has patiently taught me over the last few years and I now diffuse in three rooms and add lemon oil to my water first thing in the morning and could not begin to do without the Stress Away roller, carry one in my purse too. BUT she has not told me about that gorgeous new diffuser you have! I want one! I add RC to my bedroom diffuser at night for sinus problems, can't do without it and you're only allowed one a month due to a scarce ingredient, I think? I use it with Cedarwood and Stress Away oil. 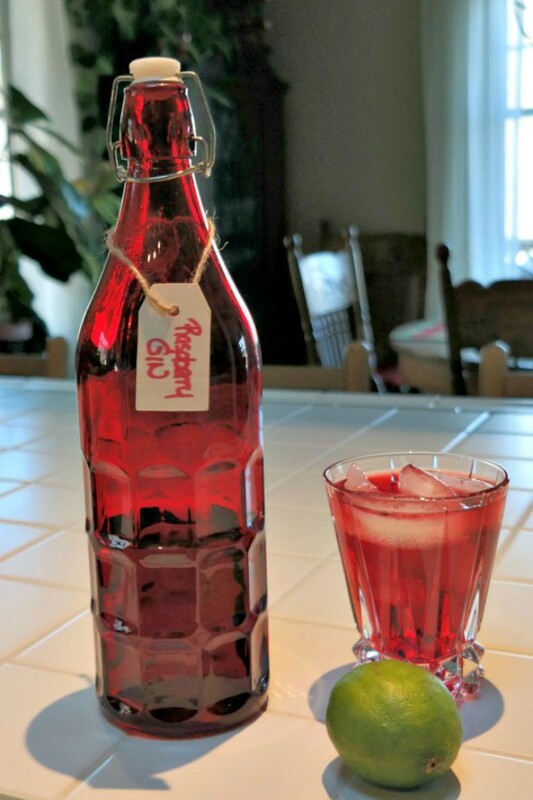 I haven't tried the NingXia Red yet even though she swears by it, but I use Thieves cleaner almost exclusively now, that's all she uses. I'll send her a link to this post, Debbie. I must mention also, to be fair, that my new daughter-in-law is with doTerra so I am also trying some of their products--love the Cheer roller. I just think people should be very careful using any essential oils other than these, never buy odd oils in stores. Know where your oils come from! Absolutely, Dewena. I did buy a less expensive lavender oil to use on my wool dryer balls, but for diffusing and applying topically it's so important to know the quality you are getting! I've been rubbing RC into my chest as I'm fighting a cold, and it feels and smells so good - clears me up right away! I've been tempted to try these, but just can't swing the cost for now. I just heard the other day that tea tree is extremely toxic for dogs, so stay away from that one. Anyways, hopefully some day I'll be able to try some.